...Winona Lake's dramatic rise from tranquil summer lake to world famous Chautauqua resort attracting more than 250,000 tourists each summer. In 1895 when William and Nelle arrived in their quest to hide from the Copelands they were one of the founders. William joined William Jennings Bryant, A. J. Heintz, John Studebaker, and several other well-known personalities on the Winona Board. The last living man to participate in the original park was Al Cuffel and in 1951 The Warsaw Times Union published several interviews of his rememberances at age ninety. Click here to read them. ... gorgeous gardens, interesting statuary donated by the wealthy Heintz family, flocks of swans, and lots of interesting things to do for the entire family. The Good News Messenger statue shown above can still be seen in the swan pond in Winona Lake today. Did anyone famous live in Winona? Left: Entertainer and preacher Billy Sunday lived in Winona. His tabernacle is pictured to the left. Billy, who began life as a famous baseball player, managed to address more than 100 hundred million people without the aid of radio or tv. His home and museum still stand in Winona today. Left: One could buy an annual pass for $6.00 to get in to Winona Lake and the entire six weeks of chautauqua programs. Missionaries and residents paid half price. The picture to the left was a oft-purchased postcard. What were all of those tin cups for? Left: Tree Spring which poured out of an old oak. It was only one of many springs Winona patrons drank from for their health. Tin cups hung near the springs which everyone shared to drink from the iron-rich water. Many of the springs were cemented later in the 1920s during an epidemic. Why are all of these Model Ts lined up? 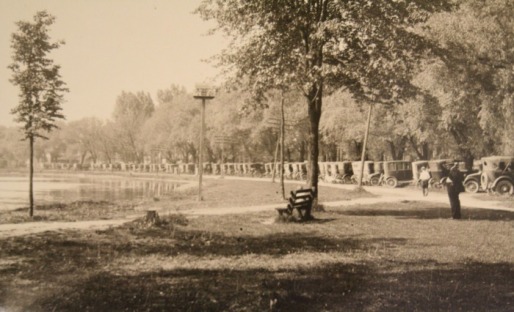 Left: On busy summer days the lake was lined with cars, bikes and buggies with people attending plays, riding down the water slide, swimming at the bathhouse, or canoeing. Left: Winona boasted several establishments near Merbrink including The Swiss Terrace which Nelle and her mother ran for William. However, the largest and most plush hotel would have been the Winona Hotel which is still around although renovated into condos. ... world famous. 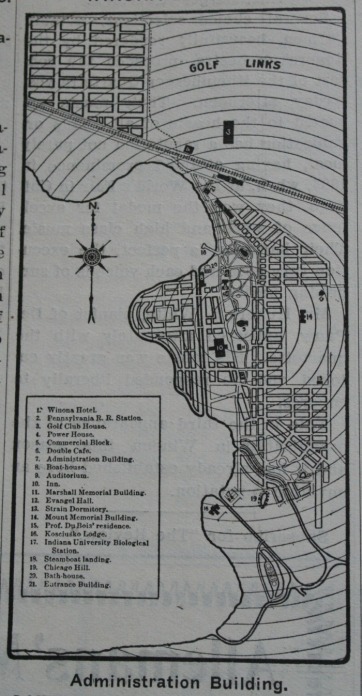 This map shows how well established the resort had become in about twenty years. Merbrink sat on the tip of the bump (which is Macdonald Island - look carefully and you can see the canal separating the mainland on the map), directly across the bay from the train station and the Winona Hotel. Until 1920 she was still empty and boarded up although the most magnificent welcoming sight as a tourist arrived. In fact, by word of mouth she had become one of the most visited sights. Lovers walked around her three times backwards and kissed for luck. Last they signed or carved their names on her boarded up windows. What kind of swimsuit did they wear in 1921? Left: For 10 cents you could use the bathhouse all day. For another 5 cents, you could even rent a suit and use the beach and the slide to your heart's content. If you needed something more, you could also rent canoes, row boats, and paddleboats. For the text of a speech about the history of Winona run by The Warsaw Times Union in 1971, click here.